Trey Friesen is still reaping the benefits of having extremely successful athletic exploits in 2018. 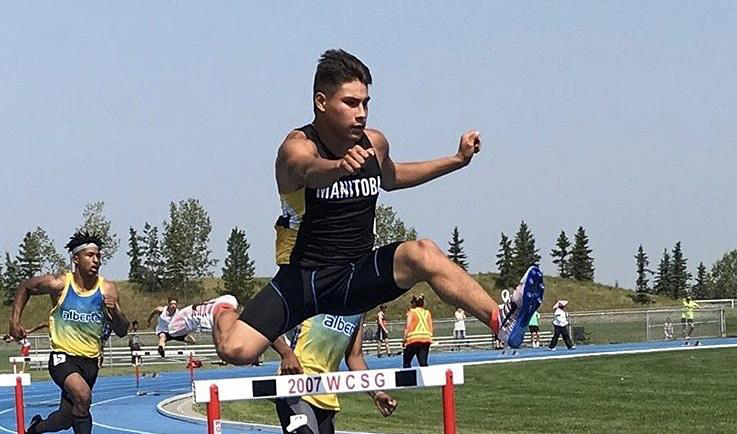 The 17-year-old, who excels in both soccer and track and field, has been chosen as the male athlete winner by the Manitoba Aboriginal Sports and Recreation Council (MASRC) for the past year. He will receive his award at a ceremony in Winnipeg on April 13. Friesen, 17, is Cree and a member of Saskatchewan’s Key First Nation. But he’s been raised by his adoptive parents, mother Joy, who is Metis, and father Danny. He lives on an acreage near Kleefeld, Man., about 15 kilometres west of Steinbach. Friesen won numerous awards during the past year. But his accolade from the MASRC is extremely meaningful for him. Friesen was caught off guard when he answered his phone a few weeks ago and informed that he had won this award. Friesen doesn’t really have an off-season. He trains year-round for his soccer as well as indoor and outdoor track pursuits. “It’s a nice big award at the end of it,” he said. Friesen, a Grade 12 student at Steinbach Regional Secondary School, served as the captain of his high school soccer squad this past fall. The club ended up winning the provincial boys’ AAAA championship this past October. The Manitoba tournament was staged in Swan Valley. Friesen plays a number of positions in soccer but was primarily utilized as a forward with his provincial championship team. Friesen, who also received an athletic achievement award from his school for participating in various sports, also had several notable track accomplishments in 2018. He participated in 400-metre and 800-metre races at the Canadian track and field championships this past July in Ottawa. “They were more for long-term development,” Friesen said of his participation in those events. Friesen also took part in the Canadian youth (under 18) track and field championships staged this past August in Brandon, Man. He placed fifth in his 400-metre hurdles event. For that performance he was awarded the male hurdler of the year award by his club, the Winnipeg-based Optimist Track and Field Club. He’s been a member of this club for four years. Friesen also had some medal-winning efforts at a pair of other meets. He won a gold medal in his 400-metre race and a bronze in his 800-metre event at the Regina Indoor Track Games last February. And he was part of the Manitoba entry that captured a silver medal in the 4x400-metre relay at the Western Canadian Tri-Province Championships this past July. That meet was held in Sherwood Park, Alta. In terms of a favourite sport, Friesen said he doesn’t have one. Friesen, who is finishing up his high school studies now, is hoping to continue his athletic career at the post-secondary school level. But he isn’t quite sure where that will be yet. Friesen said he will in all likelihood attend a college or university in Manitoba. Meanwhile, Kennesha Miswaggon from the Cross Lake First Nation, was selected as MASRC’s female athlete of the year. Miswaggon, who plays hockey, has spent the past three seasons toiling for the Winnipeg-based Balmoral Hall Blazers. Miswaggon’s coaches and teammates unanimously voted her as the team’s captain for the 2018-19 campaign, her Grade 12 year. Miswaggon also represented Manitoba at the 2018 National Aboriginal Hockey Championships (NAHC). This event was staged this past May and hosted by Nova Scotia’s Membertou First Nation. Miswaggon helped Manitoba capture the gold medal at this tournament. She was also a member of the Manitoba entry that won the title at the 2017 NAHC in Cowichan, B.C. Besides its female and male award winners, the MASRC also selected female and male coach and volunteer of the year recipients. Lezley Sutherland of the Peguis First Nation and Keith Mason, a member of the Fisher River Cree Nation, were named the female and male coach of the year, respectively. And Marilyn Murdock and Tristan Dreilich were picked as the volunteers of the year. Murdock is from the Fisher River Cree Nation while Dreilich, who is Metis, is from Gonor, Man.